As a doctoral student at the University of Maryland, I was required to take classes toward a concentration. I knew that I wanted my concentration to be in learning and development (my true passion), but I admit that I was quite nervous to take courses outside of my degree department. Still, I kept in mind the advice I received from Sharon Parks Daloz during my first year as a student affairs professional at Longwood University. She had come to campus to speak, and I had the opportunity to drive her home, which I took full advantage of by asking her about the PhD process (I knew that I wanted to obtain a PhD, but was still in the exploration phase). I can only imagine she was exhausted when I dropped her off at the airport from the amount of questions I asked, but she was so kind and patient in responding to all of them (Thank you, Sharon!). One piece of advice that she shared that stuck with me was to, “take courses outside of the field I was interested in contributing to so as to find unique contributions/ideas/thoughts/insights.” And so this was the advice that I clung to as I entered unfamiliar classrooms in unfamiliar buildings in pursuit of my concentration. Perhaps the course I was the most nervous about taking was a cognitive psychology course. I recall having to look on the campus map for the building, and arriving early the first day to make sure that I found the classroom. I wasn’t sure of the style of teaching I would experience, and knew that I would fail miserably at any course that was going to require rote memorization. Considering this thought now makes me chuckle a bit, given that such a teaching style would not implore all of the research contributions cognitive psychology has made to the learning process…at the time though I was unfamiliar with such contributions. I just knew that I was leaving the familiar discussion-based classroom environment of the Benjamin Building! to demonstrate the process of metacognition. James Zull (2011) included it in his most recent book titled From Brain to Mind. 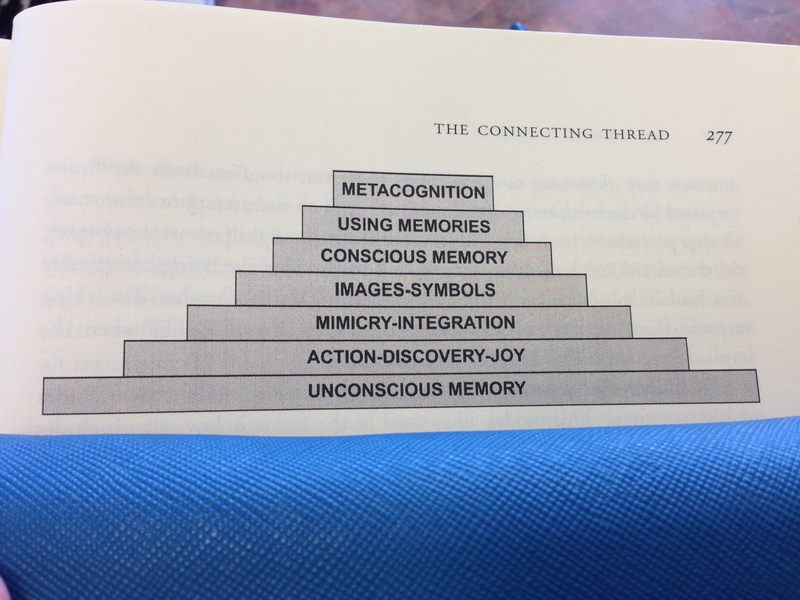 It is his depiction of the process one needs to experience to move from brain to mind…to reach metacognition. In the chart you would move up through the different levels. Zull goes into a detailed discussion of what it might look like to be “at” each “bar” in the chart, and I encourage you to read his book for more insight. What is hanging with me is the assertion he makes that metacognition depends on the nature of our experiences, and that these experiences must involve self-awareness. That such experience must allow the learner to integrate, “cognition, emotion, action, feelings, sensory experiences, and motor experiences” (p. 279). They must encourage the learner to draw and develop connections. It is from this that “the self emerges”, and it is allowing spaces for the learner to be them “selves” that allows for difference, that allows unique interactions with the world, and through unique interactions innovation thrives. Innovation is what many argue our world needs to continue progressing. Innovation is what many argue we need for survival. So, I, like Zull, offer the above chart and my reflections here to encourage a discussion to those in the field of student affairs. 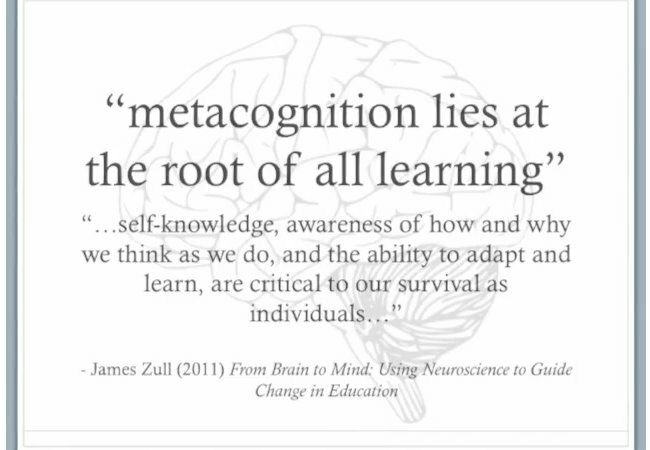 What are your thoughts about how you design experiences for metacognition within the learner? What are your thoughts about involving self-awareness for the learner?